Surprisingly it was the guitar that French flautist Guillaume Barraud started playing at a very young age, and it wasn’t until his encounter with the Indian music legend HARIPRASAD CHAURASIA that he began to find his own voice with the subtle and haunting sound of the Indian bamboo flute. From 2001 to 2006, he devoted himself to the in-depth studies of north-Indian classical music with the maestro at his famous university Vrindaban Gurukul in Bombay and was able to assimilate the spirit and authenticity of the tradition. He’s now a sought-after exponent of the Bansuri flute recital. A versatile musician, Guillaume has performed with artists such as MANU EVENO of French pop band TRYO, Levent Yildirim, ERKAN OGÜR & MISIRLI AHMET (‘The Search’ Tour, Turkey, 2005), the late SAÏD CHRAÏBI, and participated in the European tour ‘VERTIGES’ directed by TONY GATLIF (2007). He has recorded for the original soundtracks of French documentary film ‘Le Destin De L’Inde’, by Laurent Jaoui (ARTE, 2012) as well as 2015 Academy Award nominee for best foreign language film ‘TIMBUKTU’. He has just recorded for the soundtrack of Pierre-François Martin-Laval’s (PEF) next film: ‘FAHIM’ with GÉRARD DEPARDIEU (2019). In India, he had the privilege to perform with TRILOK GURTU (NCPA, Mumbai, 2006), Sanket Naik, T. S. Nandakumar South-Indian Percussion Ensemble, Arnab Chakrabarty, Babulal Gandharva, and several times with his mentor on the occasion of the annual “Krishna Janmashtami” celebration. It was in Paris where Guillaume began searching for new ways to use the bansuri outside its traditional form, getting involved in various creative projects and collaborations. In 2011, he forms the band KARVAN TRIO featuring Mathieu Bélis on piano and Mossy Amidi Fard on Iranian percussions with whom he releases the album ‘AZAR’ (Buda Records – 2013). Guillaume works as a permanent staff artist in hospital and at the PHILHARMONIE DE PARIS, promoting the bansuri to new audiences through educational programs. He has already performed in various countries such as India, Turkey, USA (AKA), Canada, Tunisia and throughout Europe. By 2015, after countless adventures and musical encounters, the artist launches his own quartet comprised of British guitarist Tam de Villiers, Reunionese bassist Johann Berby and Belgian drummer Xavier Rogé. His debut album ‘ARCANA: THE INDO-JAZZ SESSIONS’ released 9th February 2018 on WORLD MUSIC NETWORK | RIVERBOAT RECORDS (UK) has received excellent revues from the jazz press. A versatile musician, Guillaume has performed with artists such as MANU EVENO of French pop band TRYO, Levent Yildirim, ERKAN OGÜR & MISIRLI AHMET (‘The Search’ Tour, Turkey, 2005), the late SAÏD CHRAÏBI, and participated in the European tour ‘VERTIGES’ directed by TONY GATLIF (2007). He has recorded for the original soundtracks of French documentary film ‘Le Destin De L’Inde’, by Laurent Jaoui (ARTE, 2012) and 2015 Academy Award nominee for best foreign language film ‘TIMBUKTU’. He has just recorded for the soundtrack of Pierre-François Martin-Laval’s (PEF) next film: ‘FAHIM’ with GÉRARD DEPARDIEU (2019). 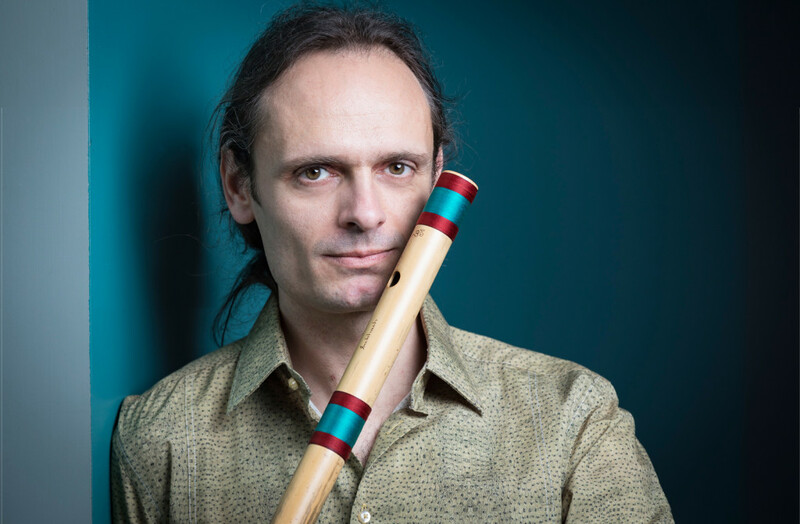 It was in Paris where Guillaume began searching for new ways to use the bansuri outside its traditional form, getting involved in various creative projects and collaborations. In 2011, he forms the band KARVAN TRIO featuring Mathieu Bélis on piano and Mossy Amidi Fard Iranian percussions with whom he releases the album ‘AZAR’ (2013 – Buda Records).